The Mitchell County Historical Society (MCHS) is dedicated to collecting, preserving, protecting and publicly displaying materials that are historically significant for the county. To do this, we need your help, and we have scheduled 2 days in February where you can share your photos, videos, items, and stories, plus get questions about local genealogy answered. Scan Days have been scheduled for Saturday, February 9, at the MCHS offices in the Historic Mitchell County Courthouse in Bakersville and Saturday, February 23, at the Spruce Pine Main Street office located on Lower Street in the new Central Park. Both events are from 10 a.m. to 3 p.m.
We ask you to bring your items and stories to either (or both) sessions. We will scan your photos, record your stories, and answer questions about local history. Rhonda Gunter will be on hand with her Toe Valley genealogy database to look up information on relatives or families in the area. You DON’T have to leave your photos and items with us…we will scan the items while you wait. 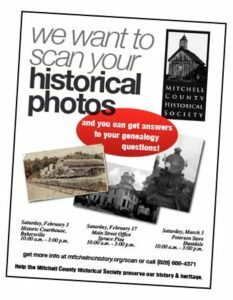 All we ask is that you agree to allow us to share them with others through our programs, displays, our Facebook and Twitter groups, and at the new Mitchell County Historical website at mitchellnchistory.org. If you have questions or need further information, please contact the Mitchell County Historical Society office at (828) 688-4371.